Arsene Wenger insists Patrick Vieira has not had talks with Real Madrid and has repeated his belief that the midfielder will stay at Arsenal. Real claim talks have stalled on their £23m bid, but Gunners boss Wenger played down any move and said he expects Vieira to remain at Highbury. "I think he will stay," said Wenger. "He has a contract here until 2007. "I have a close relationship with Patrick and I don't say what we talk about, but that's my personal opinion." He added: "I have other players with not as long on their contracts who are much more of a worry for me than he is." Wenger also admitted that speculation surrounding his captain had disrupted Arsenal's pre-season preparation. "The media speculation isn't helping and it has been disruptive," said Wenger. "But we're used to that and we will meet it together as we usually do." And Wenger said he felt no need to try and convince Vieira to stay, adding that the France international would be making a mistake if he left Arsenal for Real Madrid. "I don't want to convince him to stay, I want him to stay because he's convinced he wants to be part of this club. "If a player comes to me and says he can't win things here and wants to leave, that's fair enough. "But simply to want to leave to see something different is not enough for somebody who wants to win. "Why does Michael Schumacher stay at Ferrari? Because he knows he can win there." Wenger added: "I believe every player who leaves Arsenal makes a mistake. "Frankly, I find change for the sake of change unacceptable, the basic desire of a player is to win and everything else is artificial and superficial." Wenger's claims follow an admission for the first time from Real president Florentino Perez that they have bid for the 28-year-old. "We have made our offer to Arsenal and that is as far as it goes," said Perez, thought to have offered £18m with the Gunners holding out for £23m. Perez added: "We will not be raising it as they want so for the moment talks have broken down." Real missed out on signing the Arsenal captain before Thursday's deadline for their Champions League qualifier against Polish side Wisla Krakow next Tuesday. 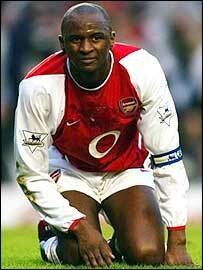 Vieira could still play in the group stages of the Champions League, however, if a deal is done by 1 September. Arsenal, who continue to make no comment on the talks, are believed to want Porto's Maniche as a replacement for Vieira, although reports in Argentina claim boss Arsene Wenger has offered £6.5m for River Plate's Javier Mascherano.